Composed of a core set of two drums and two gongs, p’ungmul is a South Korean tradition of rural folk percussion. Steeped in music, dance, theater, and pageantry, but centrally focused on rhythm, such ensembles have been an integral part of village life in South Korea for centuries, serving as a musical accompaniment in the often overlapping and shifting contexts of labor, ritual, and entertainment. 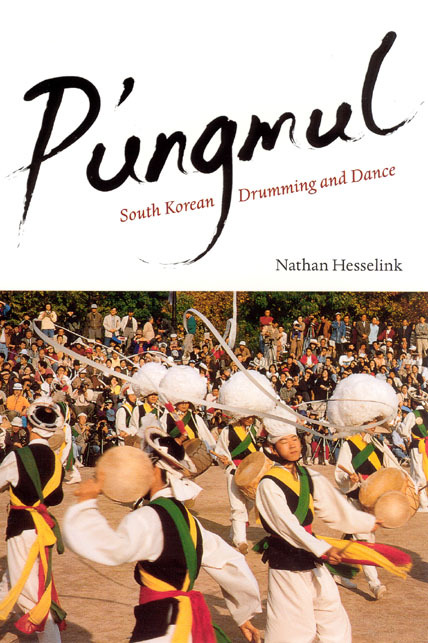 The first book to introduce Korean drumming and dance to the English-speaking world, Nathan Hesselink’s P’ungmul offers detailed descriptions of its instrumentation, dance formations, costuming, actors, teaching lineages, and the complexities of training. Hesselink also evaluates how this tradition has taken on new roles and meanings in the twentieth and early-twenty-first centuries, investigating the interrelated yet contested spheres of history, memory, government policy, grassroots politics, opportunities for musical transmission, and performance practices and aesthetics. P’ungmul offers those interested in ethnomusicology, world music, anthropology, sociology, and Asian studies a special glimpse into the inner workings of a historically rich, artistically complex, and aesthetically and aurally beautiful Korean musical and dance tradition. 3. By and For "The People"
"This monograph is especially valuable for its translations of literary sources and oral accounts from South Korean scholars and drummers. . . . An evocative portrait of a lively local scene of p’ungmal practice that is often presented as a romanticized imaginary of a national South Koprean tradition." "A great achievement. [The book] is written in a very accessible style and offers a wealth of unique insights and accounts regarding the tradition and practice of p’ungmal in contemporary Korean society. . . .Hesselink manages to maintain an engaging narrative that incorporates many interesting (and often funny) anecdotes."